In the fall of 2011 four juniors showed up for job training at Bob Jones University. We all knew each other a little: two of us had been roommates, two had gone to camp together, two had been coworkers the year before, all of us were in the Bible program. But that year we went from being acquaintances to friends to deep friends, and by God's grace five years later that is a friendship we have carried on even as life has done its best to split us up. During our junior year we were assigned a group sermon project for homiletics class in which we were instructed to work together to prepare a sermon from Romans 8:28-30. That started a theological discussion that we've never really ended. We love talking about theology, discipleship, ministry, sanctification, and how all of this relates practically to people's everyday lives. In fact, it was in the midst of one of these conversations via Facebook that someone said what the rest of us had been thinking, "We should start a blog." Now, we don't claim to have all the answers to life. But we do know where they are found, and we're excited to share what we have learned. No doubt we will get it wrong sometimes. We haven't arrived, and realize that we have a lot of growing still to come. But we are growing, are learning, and want to share. We also want to give a voice to a side of issues that doesn't seem to have much support in the social media/blogging landscape these days. You'll see a variety of posts here, from ones that are intended to be spiritually encouraging and challenging, to ones that are more thought provoking and theological, to ones that speak to current issues of the day. Hopefully what you find will help you love Jesus and His gospel more, cause you to think carefully about Scripture and theology, and maybe even challenge some of your thinking regarding the Christian life. Our desire is that as we share our thoughts others will be sharpened by them and will in turn sharpen us as we all seek to zero in on what exactly God has taught us do and be in His precious Word. Ben Hicks grew up in central New York, just south of Syracuse (Go Orange!). 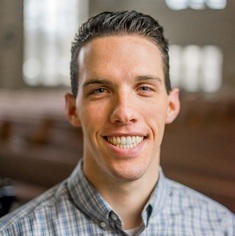 He went to Bob Jones University for college and decided the place was alright so he stayed on for grad work, graduating with his Master of Divinity. Saved at the age of 4, growing in Christ ever since then, and excited about the day he will get to meet His Savior face to face, Ben hopes to encourage others with the encouragement with which God has encouraged him. He enjoys soccer, basketball, super heroes, and Mario. Ben and his wife Brittany serve together in the Single Focus ministry at Colonial Hills Baptist Church. Michael Conn comes from the corn fields of south-west/central Ohio and is a loyal, home-grown Reds fan. Being raised on his family's farm instilled in him a deep love for the land and especially for the people linked to it. He gave his life to Christ at a young age and maintained a tender heart toward the things of the Lord. This tender sentiment grew into a burden for ministry that guided him through his college and seminary years at Bob Jones University where he finished a BA in Bible and a MA in Ministry. It was also at BJU that Michael met his lovely wife, Irene. God instrumentally brought Michael back to central Ohio while Irene completed a MS degree at the Ohio State University. It is back here in his beloved home state that Michael now serves as the Assistant Pastor of Calvary Bible Church in Columbus, OH.